I don't think there is anything better than a simple, speedy, stew-like soup on a chilly winter night. Especially when it is this easy to make and cooks in less than 35 minutes. To save prep time, you can even substitute pre-chopped onions and garlic from the produce section of your market. 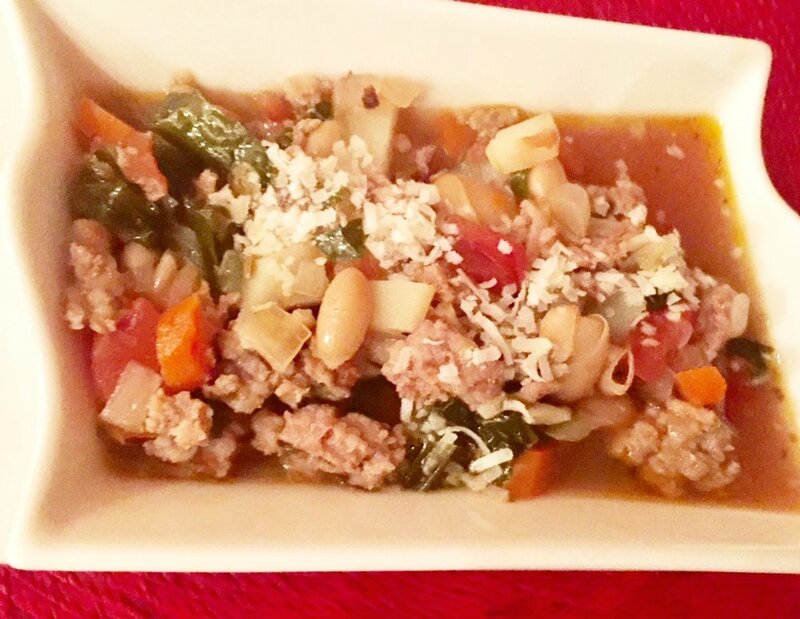 This potage is chock full of hearty veggies, such as tomatoes, beans, and kale, along with chunks of tasty stick-to-the ribs sausage. And, of course, what veggie soup isn't improved with a sprinkling of parmesan cheese? My trick for adding a layer of flavor without any extra work is to toss in one of those rinds from Parmesan cheese you've been saving in your freezer. (You have been saving them, haven't you? If not, start now. Every time you purchase a wedge of Parm, cut off the rind, slip it in a baggie and freeze it. Use it whenever you are making soups and stews.) It definitely punches up the flavor, along with, in this case, the addition of some piney rosemary. I like to serve this tasty soup with crusty bread to either dip in the soup or in olive oil. Either way, make up a pot and if you don't finish it at one sitting, it freezes great for another night. In a 5- to 6-quart dutch oven or similar heavy-duty pot, heat the oil over medium-high heat. Add the sausage and cook, breaking it up, until just cooked through, about 7 minutes. Transfer to a bowl. Add the onion, carrot, and potato to the pot, lower the heat to medium, and cook, stirring occasionally, until the vegetables begin to soften, about 5 minutes. Add the garlic and rosemary, and cook, stirring, until fragrant, about 30 seconds. Add the beans, tomatoes, stock and Parmesan rind; bring to a simmer, and cook for 10 minutes, skimming as needed. Add the kale and reserved sausage, and simmer for 5 minutes. Season to taste with salt and pepper. Serve sprinkled with the cheese and with crusty bread, if you like. Recipe adapted from Fine Cooking Magazine.